My name is Katherine Thibeau. I am a senior at the University of Wisconsin- Madison. For my communications class titled “Critical Internet Studies” I am doing a project on advocacy groups and their use of the Internet. I selected Amnesty International both for its personal appeal and worldwide recognition. I was wondering if you could help me, or help me to get in contact with someone, who could offer some insight into the ways that Amnesty International uses the internet (including social media, twitter, the website, email etc.) to communicate, organize and connect with its’ members. I realize that your organization has higher priorities than this, but I believe that your information would elevate my project/ presentation and potentially motivate eager college students to join AI or reinstate the UW- Madison chapter. My other emails were very similar… I am skeptical about the likelihood that I will here back from Amnesty International and Rock the Vote as they are both very large organizations. I am optimistic that Domestic Abuse Intervention Services will get back to me because they are local here in Madison and I pointed out that my presentation would bring more awareness to the group. I really do hope that I hear back from the organizations, and that my attempts to dig deeper aren’t rebuffed once again. While I can certainly make inferences about how these organizations use the website based on my own observations and knowledge about how organizatoins in general use the internet, their direct input would provide more credibility and specificity to my understanding. I’ll let you know if I hear back! I’ll be posted again soon “profiling” members of Amnesty International, as well as posting prior to my presentation on wednesday. 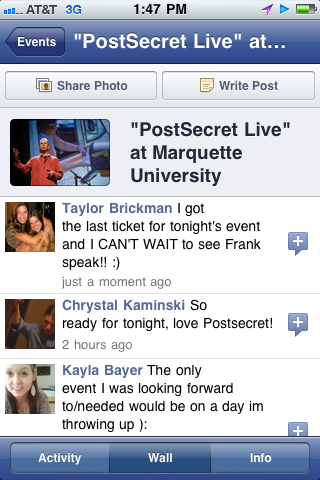 A few weeks ago, I had the pleasure of hearing Frank, the creator of Postsecret, speak at Marquette University in Milwaukee. 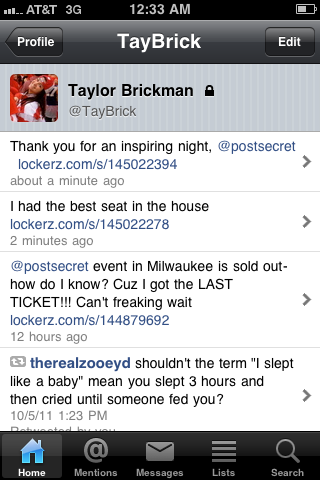 Now, I do not mean to downplay how difficult it was to get a ticket to this event! 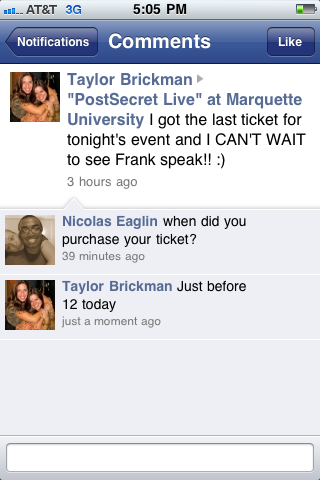 Tickets were only available to Marquette students until the week before the event. Once tickets were available to the public, they needed to be picked up at the Marquette Student Union. I made a number of calls to the box office, but they were not allowed to hold any tickets before the event. I called everyday for a week, and as the number of available tickets decreased, I got more and more nervous. Finally, the day of the event arrived. 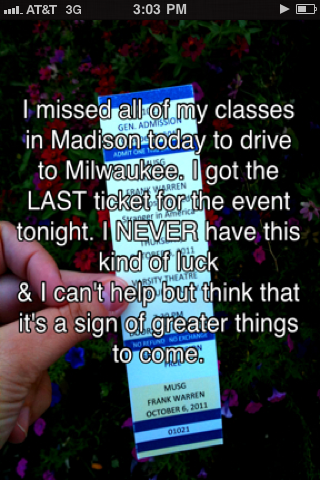 After I found out there were only 11 tickets left, I skipped all of my classes in Madison, got in my car, and drove to Milwaukee- and I GOT THE LAST TICKET!! I was thrilled. After killing a few hours at a nearby coffee shop, I decided to go to the event venue an hour early to see what was going on. To my surprise, people had already started to line up at the door! The people who were in line with me were obviously avid Postsecret fans. As I waited in line, I took advantage of the opportunity and asked those around me why they loved Postsecret, how long they had known about the site, and how they participated in the community. 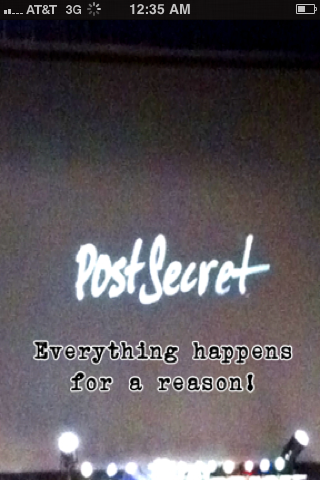 The girl infront of me in line had actually had her secret published on the Postsecret blog! She explained the thrill she felt the day it was posted, and how it had inspired her to share the secret with the person that it was about. About ten minutes after I had gotten in line, FRANK ARRIVED! Since there were only about 10 people in line at the time, he shook all of our hands and thanked us for coming. I felt like I had met a celebrity! Frank has been called “The most trusted stranger in America” and he is just as friendly as I had assumed he would be. A father and son who were in line had driven from Chicago because they had been promised a ticket, but when they arrived, the event was sold out. Frank, after hearing this story, simply looked at the stage manager who he was standing next to, gave him a nod, and the stage manager handed the father and son two tickets out of his pocket. Talk about being in the right place at the right time! Since I had a prime spot in line, I ended up getting the perfect spot in the auditorium- front and center! To my surprise, people around me were extremely friendly. It was clear that everyone was there for the same reason and the excitement was contagious. After a brief introduction, Frank came onto the stage. He shared the story of how the Postsecret project began and explained how it progressed from a community art project to a blog and how Frank eventually received his publishing deal. Next, Frank shared a number of secrets that had not been allowed in the Postsecret books (most were removed due to copyright laws). Throughout the event, Frank shared a number of stories- the one that stood out to me most was the story of one of the first secrets on the blog that received a large response. Frank had posted a secret that was written on a picture of a broken door (the secret was something about how the door had been broken by the individual’s mother when she was trying to get into the individual’s room to beat them). In response, Frank received picture after picture of broken doors from individuals who thought that they were alone with their secret. 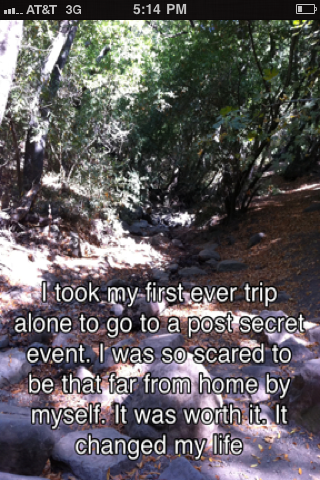 This story shows the power that Postsecret has to create an anonymous community of support. At the last part of the event, Frank opened the floor for anyone to come up to a microphone in the auditorium aisle and share a secret with the group. The girl who was in front of me in line had shared a concern that since Marquette was such a small school, no one would want to share a secret at this part of the event. To our surprise, a line immediately formed at the microphone. 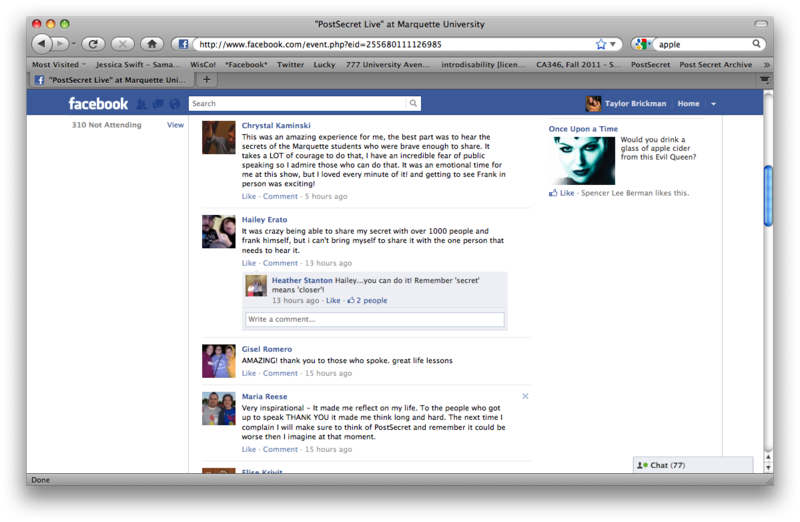 Very personal secrets were shared by a number of students. They were so brave to open up to a room full of strangers in an honest and trusting way. The audience sat in support, clapping after every secret was shared. At the start of my Practicum project I was very frustrated and skeptical about how I was ever going to figure out the command line interface of LambdaMOO and how I was going to navigate through it. Now, I have found that I am starting to actually belong in this world– I think I’ve made a friend. This friend’s name is “Donar” and he (I am pretty sure it’s a he) has gone out of his way to talk to me for several log-ins now. At first I had to seek people out and start conversations with them, disclosing a lot about myself while not always getting a lot in return. I think one of the first conversations I had with Donar consisted of me telling him that I believed in ghosts and that I wasn’t quite sure about aliens. He was not very talkative, but when I found a subject that really got him excited (engineering…) he wouldn’t stop talking. Now he always talks to me when I’m online and asks me about ghosts and all of that jazz. Regardless of how good or bad I have done in trying to understand the world of LambdaMOO, I think I have been successful- I even made a new friend. Has anyone else made friends/connections/network ties? Does your project allow you to? If you have made friends, how do you feel a virtual friend is different from real life? I decided to get a head start on my blog posts since I honestly have nothing better to do this week. So, blog 4 has to do with Googling yourself and seeing what you “do (or don’t) find.” The first link I retrieved was for my Facebook, disclosing basic information that I really don’t mind sharing. The rest were searches for people by the name of “David Pierringer” who were, in fact, not me. A couple links brought me to my uncle’s (same name) business, but other than that, I’m unaware of who or what the other links are referring to. I also decided to Bing my name and found an actual summary of my Facebook, giving away where I’m from, what I’m studying, and even providing a picture. This worries me a little bit… Overall, I really don’t know how to feel about this blog assignment. I’m torn between wanting to have my information out there, as it can make things easier, and wanting to keep certain things under wraps. While I think the information provided is innocuous enough, I can’t help but feel like my privacy is being violated. I read through the Wikipedia entry for Flickr, and noticed that they were missing a crucial feature of the website in their description. I saw that they failed to mention the fact that Flickr greets you in different languages! Every time you refresh the homepage, it will tell you “hello” in a random culture or language. It made me laugh because Flickr, as much as it is a media-based social networking website, also provides users with a way to learn languages as they go. This learning tool is unique to Flickr, and is something that other websites that feature similar aspects like Flickr does fail to include. I made a Wikipedia account, and clicked “edit” on the Flickr page. I scrolled down, and using the commands provided in the editing tool, I created a new section called “Features” and added a sentence about the language learning tool. I wrote, “Flickr allows users to learn languages as they go. On the home page of every user account, there is a greeting in a random language. Users can learn everything from Croatian to Japanese to Sign Language.” I also checked in the citations/source area at the bottom of the page, and found out that websites like Flickr.com provided information about the homepage, yet people did not mention the aspect about the languages. Necessary or not, I thought my post was original, based off of facts from the website, and contributed in a positive way to the wikipedia page as a whole. Being that Chathour came up on my search engine under “tween chat rooms” I assumed it was specifically designed for tweens. I of course am not a tween, let alone a teen, so I decided to make myself a 13-year-old girl. Little did I know, you could be of any age to register on this site. The site is fairly plain with amateur graphics and design. The main colors are green and black, and the profiles are slightly reminiscent of Myspace. Upon entering the site you are brought to a general chat room titled “weirdtown.” Being that I was unsure of how to enter other chats, I remained in the “weirdtown” chat and tried to do some research. I consistently attempted to write in the chat things like “hey I’m new here, can anyone tell me how to work this” or “how does this site work? im new!” Every time without fail no one would acknowledge my request for more information, and I would likely get a reply from a disgusting older man asking if I wanted to video chat. Next time I plan to enter different chats and see if other rooms are more likely to help me out with getting acquainted with the site.